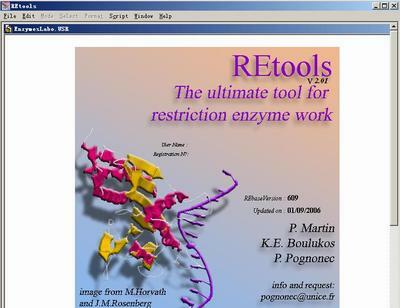 REtools, a user friendly and easily customized program to organize any laboratory enzyme stock, brings a software solution that makes restriction enzyme use and reaction condition determination straightforward and efficient. The usually unexplored potential of isoschizomers becomes accessible to all, since REtools proposes all possible enzymes similar to the one(s) chosen by the user. Finally, many of the commonly overlooked subtleties of restriction enzyme work, such as methylation requirement, unusual reaction conditions, as well as the number of flanking bases required for cleavage, are automatically provided by REtools.